The guide on a Jack the Ripper tour in London took to her task with gusto, not so much guiding us as performing for us, as if to transport her charges to a time and place as far from our current realities as possible. She wore a long black dress, a black top hat, black boots, and black, fingerless, lace gloves, and her face was a blinding contrast of whitish makeup and a shock of red lipstick. 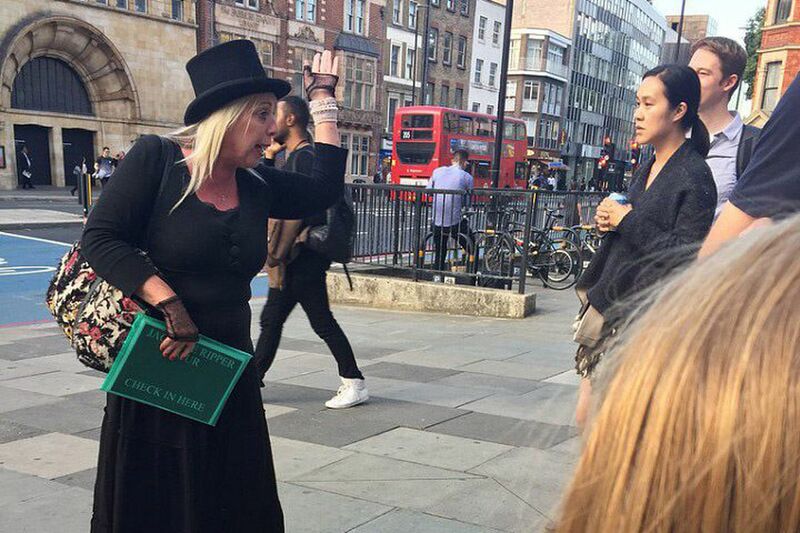 Our Jack the Ripper tour apparently included cosplay. Vacations are supposed to take you away from your everyday life so that you can get your mind off of the stress of work and the grind of home life and re-engage with the parts of yourself that get lost along the way. Our guide was doing her part, leading a couple dozen of us — including my wife and daughters, sister-in-law, brother-in-law, and nephew — through the streets of London's White Chapel neighborhood, where the Ripper had butchered his victims a century and a quarter ago. She took to her task with gusto, not so much guiding us as performing for us, as if to transport her charges to a time and place as far from our current realities as possible. But here's the thing with vacations: As much as you want them to be an unequivocal escape, real life is no farther away than an unanticipated phone call, an unexpected travel snafu, or an unwanted illness. And sometimes even a disturbingly authentic tour guide. Her historical retelling was undeniably compelling. Too compelling, as it happened. Her vivid descriptions of White Chapel's sewage-strewn alleys and pestilent boarding houses solicited cringes from more than a few of us. When she transitioned to grueling, gruesome play-by-play of Jack's first murder and the fatal beating of a young woman by a roving band of street kids, my family and I agreed it was time to bail for less intensely homicidal pastures. Quietly we lingered while the rest of the group moved on to the sites of the Ripper's next two atrocities. We ducked down a side street, and after 20 minutes on the Tube, we were safely ensconced in the neighborhood pub we'd found, raising pints of cask-conditioned ale and doing our best to shake the horror out of our bones. Just as in real life, things happen on vacation that you don't want to happen, and just as in real life, many of these things are out of your control. What counts is whether you roll with that punch or let it flatten you. What counts is whether you control what you can control. In deciding that our vacation could still be fun even if we didn't know every last anatomical detail of Jack's knife play, we were able to turn a disquieting experience into a good story and a great lesson. Thomas W. Durso writes from Glenside.